A patch including the HUD update will be coming this Friday. Once you’ve tested it, feel free to post your feedback in this thread. 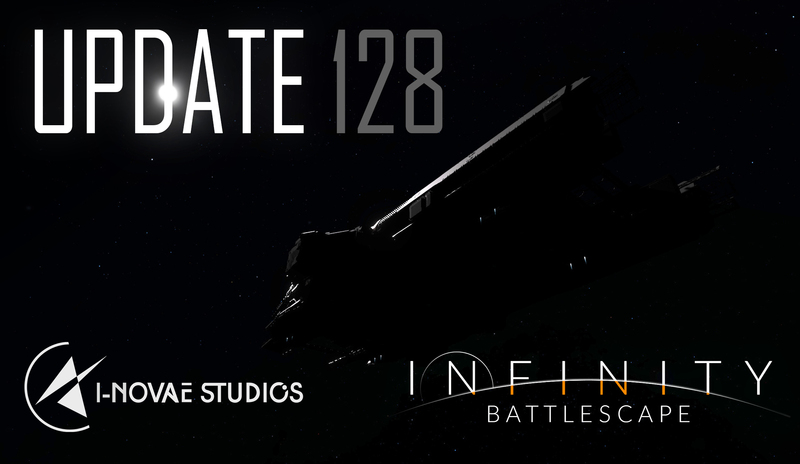 Note that a new control scheme for capital ships ( plus some upgrades on the weapons systems ) is in the works, but will not be ready for this upcoming patch. The first thing you will notice is an update in the visual style. I’ve kept the green theme but integrated it to a helmet-deformation cylindrical shader and added some bloom and (animated) holographic styling. The goal here is to make it feel more integrated to the ship. I’ve been debating between actually displaying holographic elements integrated into the 3D viewport environment, or to render the HUD into a texture and project it into the head’s helmet ( following the camera’s movements ). It quickly became a no-choice: utilizing a real 3D HUD would only work with cockpit interiors, but half the ships don’t have those ( capital ships ) and besides, a part of the HUD needs to be functional in third-person too. This leads me to the first question. 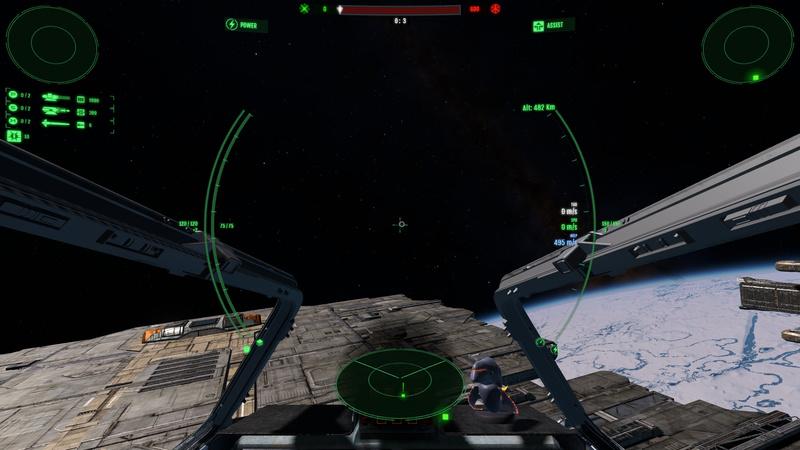 At the moment the HUD in third-person mode is minimal ( you can’t even see your ship’s hitpoints or shields… ). I’ve seen a number of people express interest in having the full HUD available and playable in third-person mode. Q1. So how much of the HUD should be visible in third-person mode ? The ring directional radar ( as before ): displays target indicators around the circular area at the HUD center. 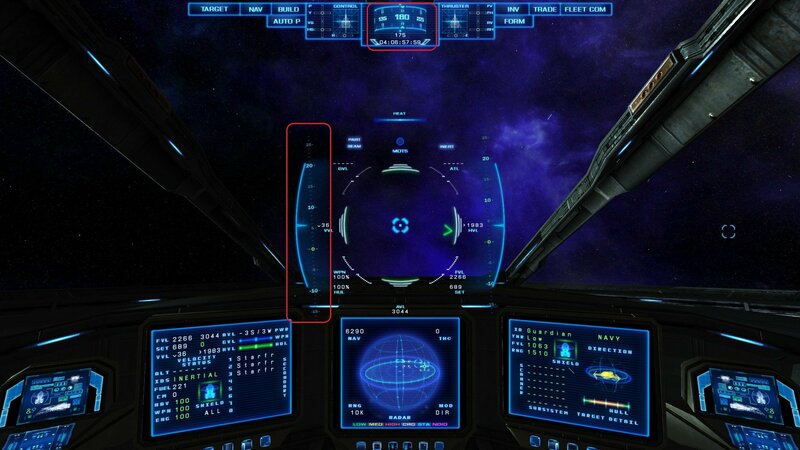 The new spherical radar ( Elite-style ): currently displayed at the bottom center of the HUD. It has a darkening halo background to be more visible on bright backgrounds. The frustum is also represented by the two lines and adapts dynamically based on the camera ( if you zoom for example ). 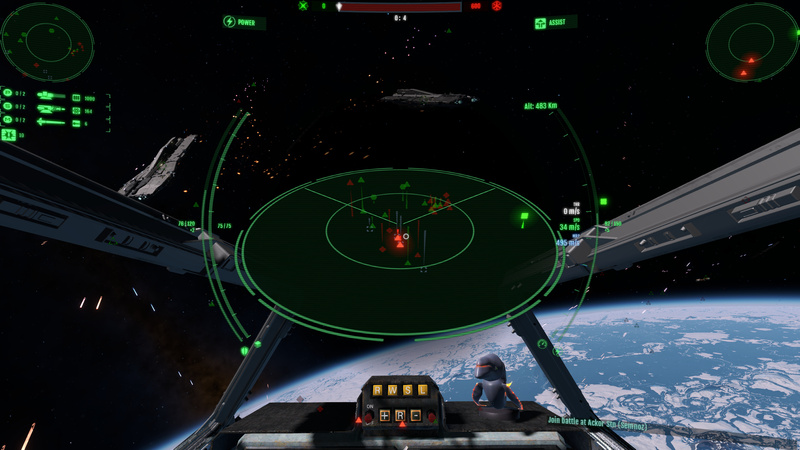 The dual front/back radar ( X-Wing style ): at each top left/right corners of the HUD. Each is representing the front or back hemisphere around the ship. The current goal is to allow players to customize which radars they want to toggle on or off based on their preference. If there are other kind of radars that you think would work better in a heavy-battle context, please let us know and we might be able to draft it quickly. Finally, the spherical radar is more strategic: it gives you a better understanding of the spatial volume around you. At the moment it is non-linear: the iner circle is at a 10 Km range, but the outer radius is at 25 Km. I tried a linear radar first, but in large battles it seemed to cluster too much information around the center and not enough around the edges, making it harder to read at a glance. Make no mistake though, it is no replacement for the actual star map. It only displays targets in the local zone vicinity around you, so it is useful in the middle of a battle to avoid opening / closing the future star map all the time, which you would have no time to do in a battle. Q2. Should the large spherical battle radar be interactive ? Another important modification to the HUD is the introduction of a smarter target coloring system. Targets are also now coherent in terms of sizing based on distance. But the critical change is that now the game can recognize and highlight threats ( or important allies - in the future, it’ll be members of your squad, but this is not implemented yet ). A ship is a threat if it has hit you in the last 30 seconds. 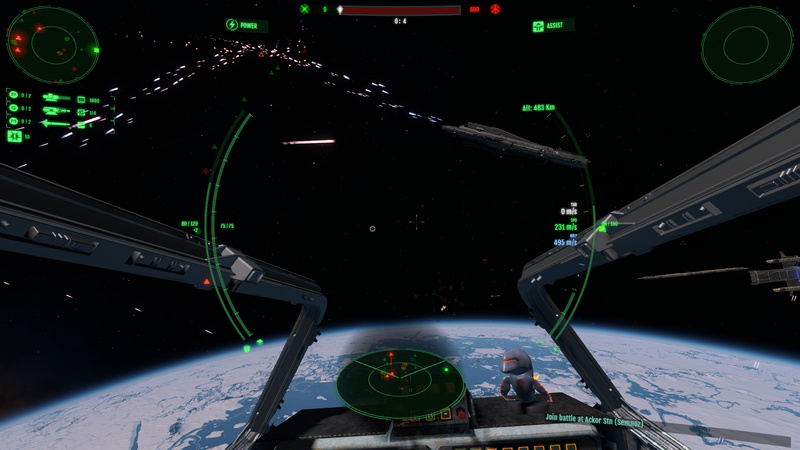 Ship “trailings” ( the artificial ribbon displayed behind a ship, showing its last movement path ) is also only visible for highlighted targets. In the previous versions, especially in exploration mode, all ships had a trailing, which sometimes made the screen a bit too busy with information. One remaining question is: given that there are now 3 kinds of radars, which should be the default one(s) ? Or should all 3 be the default ? We don’t want to overload or scare beginners with too much information… especially when some of it is redundant ( the dual front/back radar are pretty redundant with the ring radar ). Keep in mind that, technically, the larger spherical elite-style radar will always be available on the HOLD-key press, so even if the small one is not always displayed on screen, it can be brought up on a key hold. This seriously raises the question of whether the Elite-style spherical radar needs to be always visible at the bottom center. Also keep in mind that the dual Front / back radars are somehow redundant with the directional ring radar; although the dual radar shows better what’s in your dead angles, or right behind. Which begs the question of whether there’s a need to enable both at the same time for beginners. Q3. Which of the radars should be available as default to beginners ? As you’ve noticed, the layout ( positionning ) of the HUD elements has changed. The font has been changed ( it is now more compact ) and its size increased, for more readabity, especially at lower resolutions. The radars layout seen in these pictures isn’t necessarily final, but it is the best I’ve found so far. I tried moving the spherical radar to the bottom-right, but it felt less comfortable than keeping it at the bottom center due to the amount of distance your eyes have to travel. I’m less sure about the positionning of the dual front / back radars. They could be moved closer to the center ( replacing the score bar ); feedback on that is welcome. I’m also not sold on the position of the weapons. I originally tried to move this information a bit below, on the left center, but it felt too invasive with the central ring. There’s going to be a need to display more information in the future, too. The ED ( energy detection ) value will probably move to the top-left; at some point I’d like to show some information about the selected target. This could be displayed in a small window in the bottom-right ( that’s why this space is reserved for now ). Mission objectives will appear below the back radar, on the top-right. There is space for a total of 12 states ( 3x2 on the left side, 3x2 on the right side ). I’m still unsure about the team score bear ( top-center ). I haven’t touched it, but it’s not exactly an essential part of the HUD, so maybe it should be moved to an actual UI menu or to the team leaderboard ( TAB ) instead. Q4. Should the team score bar remain visible at the top of the screen at all times ? This should be useful to time usage of chaffs / countermeasures. In fact in my tests, I’ve found it to be dramatically easier to counter missiles now ( as long as you pay attention, which might be easier said than done, in a heated combat ). Another change: the target lead reticles now flash red when a hit has registered ( in addition to the small hit feedback sounds ). I’m still playing with icon updates for reticles or the mouse; nothing is set in stone yet. Reticle for a firing weapon is also highlighted. While this is an important milestone for the HUD, it is not the last one. Nothing is set in stone, so your feedback at this stage of the development matters. Please let us know if you see better / easier ways to improve the HUD. when shields are no longer a single bar, but split in 2, 4 or 6 sides, each with their own bar: where to display that information on the HUD ? Originally we wanted it to be part of the circular ring, but adding a circular meter on top and bottom will obscure the HUD. Maybe a ship schematic should be shown in a corner of the screen instead. we’ve tried an experiment to display capital ships or installations as shapes instead of symbolic icons, to better represent their size/shape. So far the results are pretty messy. We might introduce it back in a future patch just as a test to get feedback. It is even worse when facing the planet with the blue/white atmosphere. I can’t tell from that initial screenshot but did you add a drop shadow around all the hud elements? Having some kind of bright/dark contrast around all the hud elements would help (like a black outline). I’m guessing the larger font size will also help out as well. Just an initial personal opinion here, but I feel like the THR/SPD/WRP text should be right aligned and then the speed numbers can be moved closer together vertically. Q1 - I’m fine with the 3rd person HUD as is. The only one thing I would like to add to 3rd person is the circle showing your current direction vector. Q2 - I think a toggle w/interactive would be the way to go. One thing I feel that’s missing is a more quick effective way to communicate with team mates. I’m thinking if you can add some sort of quick ping system to the radar where you could click on an individual enemy target on the radar it would relay to team mates your attacking that target (maybe it says ‘Booyaah attacking’ next to the target. So when ppl warp-in and decide to start attacking a base everyone kind of has an idea on what everyone is doing. The current comms menu seems pretty rudimentary but maybe I don’t really know how to use it properly. Q3 - I wouldn’t mind having the ring radar staying around at least to indicate what direction your taking fire from and pointing an arrow towards your current locked on target. Would be nice to have a simple class icon displayed next to the target reticule so you know what class of ship you are targeting. I believe when you target an interceptor the current HUD target is a triangle while everything else is a square. Currently I find it a little hard to target individual sections of a base. Besides the obvious cap ship respawn hangars that are obvious with the blue rings, targeting the floating turret defenses feels like a real pain right now. Maybe adding individual targeting markets for each spot on a base? Or is it intended by design to be manual targeting? Excellent update Flavien! I look forward to testing the HUD and I’ll reserve any further feedback until I’ve done so. On the surface of it though, it looks good! I’m definitely a supporter of decluttering whilst maintaining function and have voted accordingly. This game is so beautiful, we don’t want too many HUD elements getting in the way! I’ve always felt that third person view w/ hud elements provides a worse gameplay experience for most players, but also once added basically becomes mandatory because third person provides competetive gameplay advantages. For fighters anyways i’d really prefer if the HUD was still first person only, but for capital ships i dont see the need to limit it since both modes are essentially third person already. I’ll have to make another post once i actually try the new radars and hud changes but they look pretty good on first glance. I feel like with three circles on screen it might feel weird though, and that’s screen real estate that could be used for wider scope maps or other elements. Here are a few initial thoughts I had on the questions. I’m not sure how these will actually play out, these are just my first impressions, except for Q2. Q1) I’m actually a bit torn between Minimal and Normal. I would say that, for corvettes and smaller, there’s no need for the extra information, as you’re probably just looking around. For Cap ships where you’d be using manual turret aiming, stats would be nice. Q2) I want my Homeworld map. Q3) I think that the Front/Back dual hemispherical radar is a really neat idea that addresses a lot of the issues I have with the ED style radar. The biggest issue with the ED radar is when things get messy. You have dots and lines zooming all over the place, and even with certain dots highlighted it’s still going to be a mess if it’s anything else other than a 1v1 type fight in an isolated environment. This is the type of combat normal in ED. ED doesn’t have anything nearly the scale that this game has. Having to check both sides is the only downside, but I can’t imagine that sole disadvantage would make the ED better. Now that said, the ED style does have a very nice advantage when fighting a single target over the semi-spherical, and that is that you don’t have to keep looking between two screens to see where it is. I therefore propose that perhaps both the Front/Back Dual Hemispherical radar and the ED-style radar are used. The only caveat is that the spherical radar doesn’t activate until you select a target or a group of targets. At that point, only those selected targets will be displayed on the spherical. I think that this is a nice way to make it easier to find a target, even in larger fights, while still having a convenient way to track a single target. Bonus is that the spherical radar can be pretty small, as it’s usually only telling the direction of a single target. Q4) It seems like you’re already having an easy-to-access radar screen, just use that to display the score, imo. Too many changes and to long of a post to answer all questions, and most should be answered after actual testing and seeing how it works out ingame. It is a highly subjective thing, i have no doubt people will have vastly different preferences. Having such a broad base selection is pretty smart, imho. Personally, most radar solutions in a full 6dof game have never done it for me. The direction ring, as you call it, is still what works best for me, as it has the most important information, in which direction to turn to face target/enemy. But imho, it could easily give me the full 3d situation by adding the other 2 missing coordinates for the objects on it. That is distance and angle from my subjective front vector. Or speaking in spherical coordinate system terms, with my front being north/up/+z/zenith, i do already know the Azimuth/Azimutal Angle, but i lack the Inclination/Polar Angle and the Radius/Radial distance to describe/understand the position of a target. First, pick a preferred FOV - Cutoff for what goes on the radar ring and what does not. This Cutoff is either the screen edge, or a large circle(also visualized on the HUD) originating on the screen center and just touching screen top and bottom. objects that pass all filters are represented the following way, moving from inside/on the ring towards outside/pointing towards outer ring/screen edge: A larger coloured(friend/foe/neutral/targeted) dot, giving the Azimuth angle as now. A short “scale” with an coloured orthogonally crossing line/bar, representing the Inclination/Polar Angle. Either going from 0-180° or from [outer circle cutoff angle] to 180°. (So for example, a ship is right behind you. Its line/bar is thus in the outward position on the scale. You turn 90* towards the Azimuth of it. Now the line/bar is in the halfway position on the scale. You continue to turn towards it, the line/bar moves further on the scale, until the object crosses the cutoff and siappears from the radar ring and is now in plain sight onscreen/inside large cutoff circle.) Next comes a coloured icon indicating the object type. 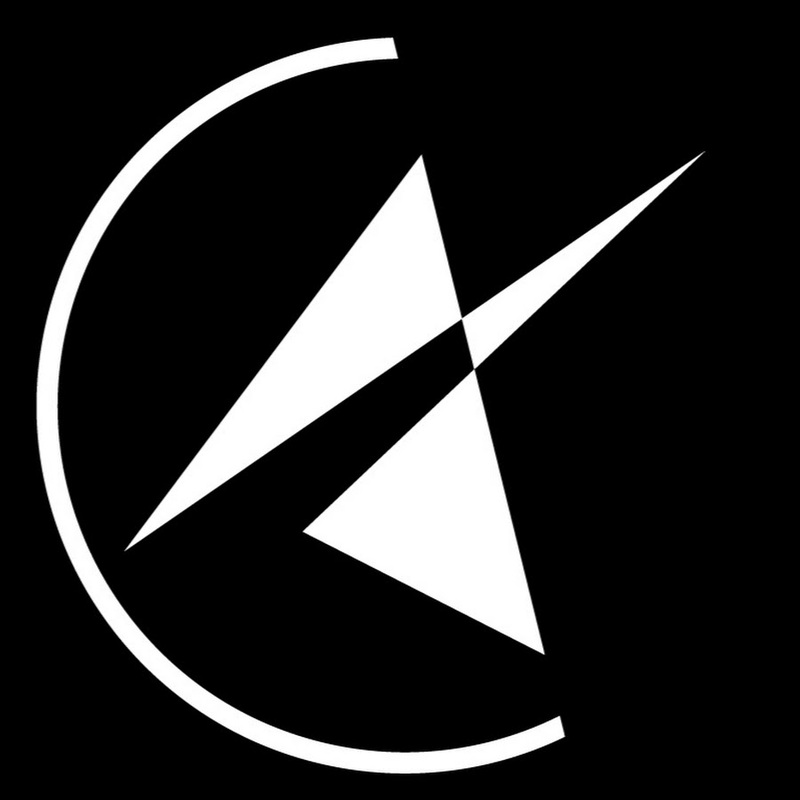 The icon is identical to the one of an inside-cutoff/on-screen object of the same type, but probably smaller. Next comes the distance in plain text, because i think people can not deal well with logarithmic scales, and another linear scale would have little use at the distances we are dealing with. I expect such a system to work to maybe up to 20/30 objects being on radar at the same time until complete visual collapse/unreadable conditions. Less if cluttered in one particular area of the radar ring. But it is the most elegant/useful system that i can think off, every other radar system is either too compressed or too dispersed or gives me too many coordinate transforms to perform in my head. This one gives me the direct distance to stuff, so i can tell when to start worrying, and i instantly know both angles to make a precise turn towards an object. As i said, might be completely unworkable/inferior for other people, spherical/polar coordinates work well for me but some people think cartesian. And one downside is i think it would not work well, if at all, for capships/3rd person. The 2-angle precision turn info is most valueable in cockpit view “you fly the gun” - Interceptors. We will NEVER have a HUD / UI that will serve Capital and Small ship needs equally well at the same time. Imho, we need one optimized for each. All feedback i give/gave is therefore for the current version and evolutions of it, under the assumption that this is the first person/cockpit/small ship one. A capship (corvette and higher) one should be optimized for 3rd person and non-twitch based, less direct controls. It will probably also incorporate much deeper ship management options than would be wise for Inty/Bomber. How about the best of both worlds. Toggle based but with no interactivity so that we can keep radar on screen, while at the same time still being able to have full control over ship. That is unless the usefulness of an available interactive radar outweighs the aforementioned toggle with no interactivity but with nonstop ship control. In order to dig deeper with such a dilemma, we will need to see what “interactive radar” entails exactly and what those radar activities can actually provide during battle. My view on layout is simple; the more asymmetrical, the happier I will be. A cleaner look would be to bring the front/back radars in closer to the center. More precisely, 1/3 of the way in toward the center of the score bar and the exact same distance down from the top of screens edge. X-wing style is my favorite. But it think majority of people would be more familiar with 3d Elite style. It is awesome to have a choice. Perhaps a Communication/match status history. Important objectives location. Current location info. Or that weapon selection/info screen. And if player starts to change weapon grouping it could auto-pan to it ala Elite D.
I think Elite did this part right. Their MFDs aren’t necessarily visible in the heat of battle, but when you look at them/hit their hotkey you turn to look at it to change options. If they are truly optional, allow them to be set to a hotkey to quickly look to them and back to the main fight. On a side note. I loved the polls in this update. I always try to skim updates but I don’t always have the time to come up with feedback or a good idea. It sounds terrible but I have to say I like the options of still giving feedback and given a choice rather than having to come up with my own idea. I want to preface this by saying thank you again for being one of the rare space games that use a ring radar instead of placing directional markers at the edge of the screen. 1. Is the threat Front or Rear? 2. Which way do I turn? The Front/Back radar also gives an excellent way to verify that I have the right target selected if the Spherical radar is confusing. The spherical radar can often be slower to read and doesn’t give me an immediate view at a glance. However, outside of dogfighting combat it is still useful. 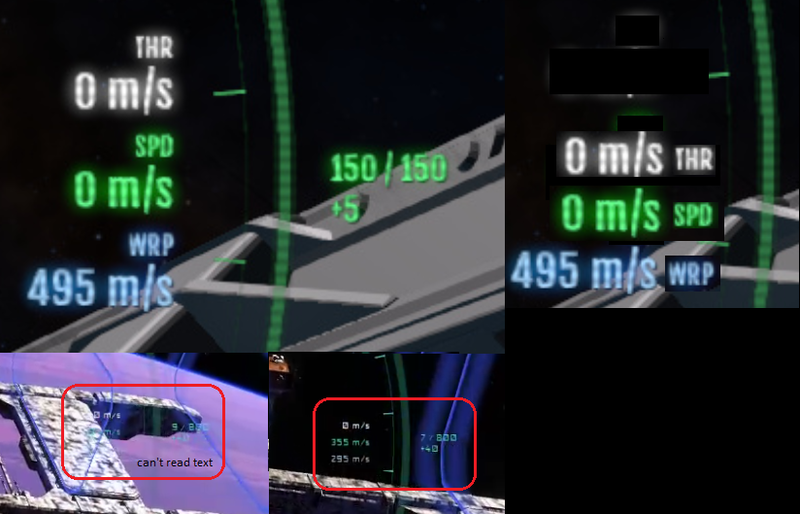 One thing I notice with the above screenshots, the icon needs to communicate if the target is above (▲pointing up) or below (▼pointing down) the ship’s reference plane because the connecting lines don’t always read well. I think Elite does this switching of icons but I haven’t played for a while. Looking forward to taking a look at the radars in-game. For non-capitals 3rd person should be limited because it can be abused. Eg using an asteroid to hide from sight and from sensors but being able to use 3rd person camera to peek out. A ship has fired upon you in the last 10 seconds: If able, add a blinking outline around the icon in a different color. Missiles should always be considered as having fired upon you in the last 10 seconds. This would give an additional differentiation between active threats and merely potential threats. This is good, but often times, multiple missiles are inbound at once. If the closest missile is one that has already passed you, then you might not get the notification of the one behind it until it’s too late. I would propose having a short threat stack section, which would just be a list of enemies actively firing on you. Just a simple list of ship name,ship type icon, and distance. The stack should only list the closest 5-7 threats. Update the distances regularly. The stack order should be updated a little less regularly to prevent the stack order from rapidly changing positions. This stack would be in addition to the current missile warnings. One remaining question is: given that there are now 3 kinds of radars, which should be the default one(s) ? I said the elite style just because I think more new comers would be able to relate to it. Beyond that, it is kind of an eye-sore in that it covers up the cockpit dashboard. If it can be integrated into the cockpit, I think that would be best. Perhaps, for the interceptor at least, remove that top geometry and make a little holographic cradle for it. @Booyaah’s request for a compass could be integrated around the periphery of the cradle, or in conjunction with the radar within it. Ideally, I would like to see radar type modes be covered in a tutorial and let the new player select it from there. Elite actually forces a ship function flight check the first time you play. If doable, I think that might be warranted. I didn’t vote on this one. Regardless of whether or not it has an interactive mode, toggle or hold should simply be separate key bindings so the player can choose, or even have hold on one key and toggle on another. If there is interactivity, it would obviously only be active in toggle mode. This answer applies to anything like this… There is absolutely no reason not to provide extra key bindings that simply aren’t bound by default. If the added bloom behind the text is supposed increase visibility, it will fail as it is the same color, rather than say… black. It looks like there’s a slim shadow line around the text as well as the bloom. Q1. It should not be possible to fight in 3rd person on subcapitals, so maximal HUD is out of question. I voted “normal” with capitals in mind as a middle ground while we are waiting for their HUD update. Q2. Voted “hold key”. Interactivity is for the star map IMO. Q3. Directional ring radar is a must for quick orientation, and the spherical elite-style radar has the least redundancy with it, so it make for a good default IMO. I would probably use directional + front/back hemispherical myself though. The elite-style radar would be much more valuable in atmosphere if the ground is shown like in elite. Q4. Team score is leaderboard material. It should not clutter the HUD. Thanks to everybody for all the feedback. I don’t have time to fix / change anything for the upcoming patch but as usual we’ll continue to iterate over the HUD in the coming months to integrate all the feedback. So there’s a community event tomorrow afternoon? When is this patch getting pushed out? I’m not seeing any updates yet in the launcher…or is this event going to be on the current patch?